Since I'm going to be out of pocket all weekend, thought I'd leave a few extra posts. Plus, I'm behind on posting my 365's. This one is not the most flattering picture of myself, but I'm nearer to 40 than 30 now so, who cares. I had to work off some frustration before the whole family piles into the car to marinate in the mixture of whatever attitudinal (?) juices we've each been stewing in to go camping. Mine is the temptation to be bitter. And from talking to some friends yesterday, sounds like a good deal of them are trying not to be too. 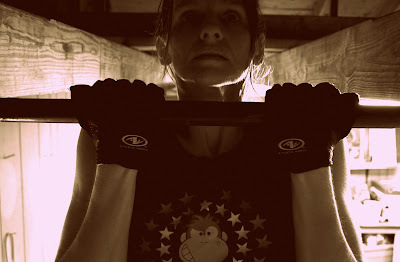 So, I worked out in the garage with the heavy bag, hoping I'd be too tired to not forgive. And I am.